Canine lovers listen to the dog whisper. Equine lovers take advice from the horse whisper. Gardeners who adore bulbs also have a personal source of information — “the Bulb Hunter,” Chris Wiesinger. He received this well-deserved title from a 2006 New York Times gardening article describing his bulb searches. This young man drives his truck across the South looking for flowering bulbs that have grown for decades and bloom with little care. His fascination with bulbs began as a child and culminated with a senior project at Texas A & M University when he wrote a business plan for a bulb nursery. This interest and research has led to the establishment of his Southern Bulb Company and to speaking engagements across the United States and in Europe. 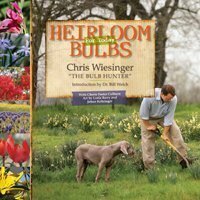 With each bulb introduced in Heirloom Bulbs for Today (Bright Sky Press), Chris entertains the reader with a story of how and where he and his dog dug the bulb. From abandoned homesteads to old graveyards, he relates humorous and realistic experiences with the owners and the bulbs. In addition to the stories of spontaneous bulb discovery, he describes famous locations where the bulbs also grow. The Bartram Garden, the Robert E. Lee home, cemeteries, arboretums and historic sites in the South are pictured and described like a gardener’s travel guide. Plants are listed by Latin name, accompanied by usual common names. Color photographs and botanical drawings ease plant recognition. I was able to identify an enormous flower that I remembered from childhood at my grandparent’s long-gone home as a white spider lily. From the history provided with the plant, I learned that it was a native plant, first recognized in the 1800’s in Mexico by a Swiss-French botanist. In addition to photographs and history, the plant’s appearance and details about its specific needs are given. Here the bloom’s size, color, time, and fragrance are listed as well as the foliage’s time of emergence and height. The required care of the plant includes necessary soil type, light, moisture, planting time, when to divide the bulbs, and when to remove the foliage. Even the amount of time the bloom will look attractive in a vase is provided. He concludes this information with notes of advice that he has discovered from growing the plant himself. Christine Thomson is a Raleigh gardener obsessed with plants. She is a volunteer at the Raulston Arboretum and fills her spare time reading books, especially volumes about vegetation.